You can represent your stories in an awesome timeline format by setting images, videos, slide-show and custom design and colours according to your theme. You can use this timeline plugin anywhere via simple short-code. The plugin contains an advanced admin panel with lots of options for styling, customization and more. If you find our plugin and support helpful.Please Rate and Review us. It helps us grow and improve our services. We are thrilled to bring you latest version of Cool Timeline Pro with advanced features – BC/AD years support, add custom text instead of date, 3 new designs, Facebook page timeline, visual composer support, new animation effects etc. 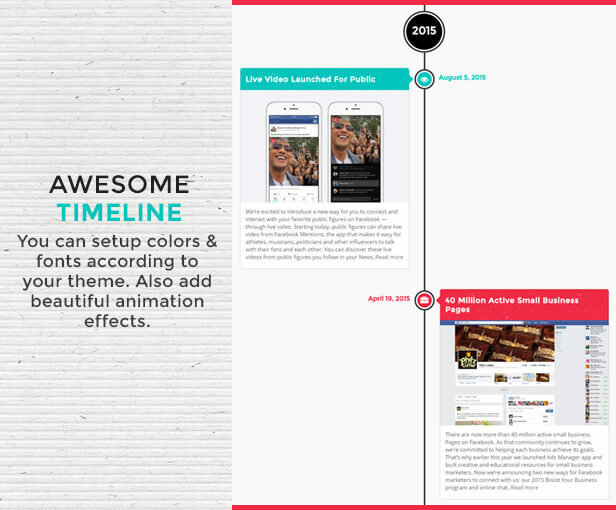 It is now easier to design an awesome timeline using brand new short-codes & setting options. New version introduces several new timeline design features. Historical Dates – Allow you to set any year (Also before 0 – BC/AD). Animation Effects ? Add animation effects on timeline scroll. Stories Images in popup ? Display stories images in popup. *While updating to latest version you will not loss any data. – Added:-Integrated scrolling year navigation in category filter layout. -Fixed:- Fatal error: Cannot redeclare ctl_pagination() error. -Fixed:-Notice: Undefined property: stdClass::$slug in admin side. improvements:- Improved rewrite rule and removed flush rewrite rules code. – new_feature – Integrated brand new designs.Modern and clean design in vertical timeline styles. – new_feature -Added new Horizontal timeline desgins with single active story. – new_feature – Managed content timeline shortcode. – fixed -Fixed rating notice issue. – Fixed -Fixed compact timeline issues. – Improvement -Improved overall code. – new_feature – Integrated ajax load more in compact layout. – new_feature -Added new Horizontal content timeline shortcode generator settings in shortcode generator. – new_feature -Added Starting story settings in Horizontal timeline shortcode generator. – new_feature -Added Auto scrolling setttings in Horizontal timeline shortcode. – new_feature -Updated all languages translation files. – new_feature – Integrated Category based fitler in story timeline and content timeline. – new_feature – Added RTL support for both vertical and horizontal. – new_feature -Added Go back to timeline link in story details page. – Improvement -Removed Story Year dropdown from story section and managed Year section with Story date. – new_feature – Integrated Ajax load more feature in Story timeline and content timeline.Users can easily enable it from shortcode generator. – new_feature – Added ability to quickly update order of custom order based timeline in all stories section. – new_feature – Added timeline styles in header and scripts in footer. – Improvement – Improved loading speed of compact timeline. – Removed – Removed preloader from compact timeline. – Removed – Removed settings panel instructions images. – Improvement – Improved code snippets. – Improvement – Improved Shortcode generator UI. Integrated buttons on top. – New_feature – Added pagination settings in shortcode generator. – Improvement – Changed custom order number dropdown into text field. – Added :Integated Automatic update feature.Now all users receive notificaitons in plugins section like WordPress.org plugin updates notications. And users can easily update plugin with one click. – Added :Single Story Color settings.You can easily set color of each story from story section. – Added :Added image icon option and settings in story section. – Added :Integrated dynamic Alt text in featured image. – Fixed :Gravity form js conflication error. – Improved :story content create function for image, video and slideshow. – Improved :Created function for stories date. – Improved :Timeline container page loading speed. – Improved :Included files based upon conditons. – Removed: Removed common-loop.php file and converted all code into functions. – Added : New compact layout for the timeline. Now you can create timeline in a masonry style without extra blank space between stories. – Added : Integrated sticky footer navigation for vertical timeline. – Added : New compact layout settings in shortcode generator and visual composer settings. – Added : Multiple sticky navigation for multiple timelines on one page. – Fixed : Timeline pagination problem. – Fixed : Horizontal timeline multiple stories scrolling problem in mobile devices. – Improved : Overall scrolling navigation design. – Added : Custom order based stories labels and order number in all stories section. – Added : Custom link of stories on featured image. – Fixed : Custom order based timeline stories wrong ordering problem. – Fixed : Missing terms issue of wordpess version 4.3 or later. – Improved : Changed HTTP CDN links into HTTPs. – Added :Stories description setting (full/summery) inside shortcode generator. – Added :Latest Font Awesome icons inside horizontal timeline. – Fixed :Horizontal timeline continues looping problem. We have disabled navigation buttons after the last story. – Removed :Single story page. We are now using WordPress default single page to show stories. – Fixed :Optimized overall PHP code. – Fixed :Content timeline short-code generator large height problem. – Improved :Repetitive code using common functions. – Fixed :Minor fixes in CSS and JS files. – Fixed :YouTube video full screen issue. – Fixed :Fixed custom styles loading problem in horizontal timeline. – Fixed :Fixed scrolling navigation auto hide problem. – Fixed :Timeline stories wrong orders problem. – Fixed :Fixed timeline styles loading to each page bug. _ Added :- Added styles and scripts on particular timeline page. – Improved:Timeline Page Loading Speed Improved. – Improved :Minimize JS and CSS files. – Improved :Optimized timeline loading speed. – Improved :Optimized google fonts loading speed and also added on particular timeline page. – Improved :Added CSS and scripts based upon timeline types. – Added :Added new custom order based timeline feature.now users can add any thing in a timeline. – Fixed :Shortcode generator errors with other languages special charactors. – Added :Added support for post formats in content timeline like(video,audio and galleries etc). – Improved :Minor js and CSS fixes. – Added :Custom link option in story section. – Improved:Improved timeline loading speed. – Added : Added new designs for Vertical timeline and one-sided (Default, Flat Design, Elegant Design, Classic Designs). – Added : Added new designs for Horizontal timeline (Default, Flat Design, Elegant Design, Classic Designs). – Added : Added new designs for Content timeline (Default, Flat Design, Elegant Design, Classic Designs). – Added : Content timeline with specific category. – Fixed : minor bug fixings. – Added : Categories filter in all stories page. – Fixed : Fixed Footer extra space issue. define(‘DISALLOW_FILE_MODS’,true); contant in wp-config file. -Fixed:Horizontal Timeline minor bug fixings. -Fixed:Shortcode problem with Divi Builder fixed. -Enhancement:Migrates google fonts from http to https. -Fixed:- Multiple timeline issue on same page. – Added : Horizontal timeline. – Added : Icons for timeline. – Fixed : minor style fixes. – Fixed : Custom styling Bug fixing. – Added : Single sided timeline layout. – Added :Timeline multiple skins(Light,dark,default). – Added :stories Pagination feature. – Added :added year disable feature in settings panel. – Improved : HTML and CSS of timeline. – Updated:Shortcode generator with layout and skin features. – Fixed: Minor CSS fixes. – Added: the time option to set the story time. – Added: the title color option to set the story title color. – Added: Stories orders(ASC/DESC) feature in shortcode. – Added: Created plugin transation file. – Updated: Extended story year from 1850 to 1700. – Updated: Timeline z-index with fixed menu bar. – Fixed: Extra space with Full HTML option. – Fixed: Story date translation issue.